Microsoft - Can you say 'security'? This subject sounded familiar and I see that I blogged about this in December '07. I received a padded envelope in the mail yesterday. The only reference on this package was a return address label that read: Microsoft 555 Monster Rd SW Renton WA 98057 There was absolutely nothing in writing contained inside this package. 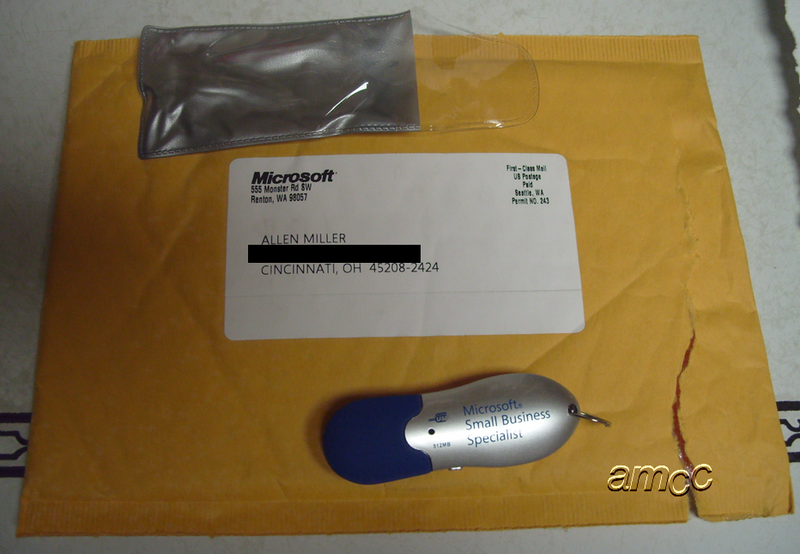 The only contents was a 512mb USB memory stick labeled Microsoft Small Business Specialist. As knowledgable IT professionals - are we expected to just trust that there is nothing bad on this memory stick? This might be a social engineering ploy and wouldn't we have egg on our faces? Microsoft, with your 89,000 employees or whatever the number - I should think that you would have one or two that could teach the rest some better means of communication - perhaps you could include a piece of paper that explained who and why this device had been sent? Or perhaps, provide a telephone number that recipients (us) could call to verify the authenticiity of this device.